doors for your metal building. Sliding doors provide a secure low cost entry into your steel building often used for a variety of reasons and on all steel building models. Usually sliding doors are used on steel horse barns because of its quiet manual operation and size options. What is unique is they slide sideways apart from each other giving you total clearance on top of your entry way. So moving large vehicles through your building’s entrance is a good reason to have sliding doors. Unlike roll up doors and sectional doors which eliminate some of the entry’s top clearance, sliding doors give you complete top clearance of your end wall entrance way because it slides sideways outside of the building and don’t take up headroom similar to overhead bi-fold doors. It is a one or two door system which slides on top and bottom tracks. Solid heavy gauge steel girts guards against damage from machinery contacting the doors. These doors are virtually maintenance free with self lubricating and aligning system and glide easily across the tracks. Your doors come with custom hardware for easy installation and come in colors to match your building’s exterior for a complete door system. Metal Building Kings® sliding doors come insulated to go with your garage kit insulation so your entire building is climate controlled or can be non-insulated galvanized steel. Whether you’re looking for a commercial grade pre-engineered heavy duty steel door or a lower cost sliding door for your horse barn or agriculture steel building, Metal Building Kings® has several options to choose from. Steel sliding doors are manufactured to last with quiet operation and manufactured with galvanized commercial grade heavy gauge steel. Sliding doors come in a variety of sizes up to 14 feet wide and 14 feet high (ask about larger sizes). Sliding steel door systems are mostly used for horse barns and agriculture because they give 100% headroom clearance at the top of the building, come in wide dimensions and do not alarm livestock or horses. This door system uses less moving parts and has less wear and tear on the components. So there is less maintenance on sliding doors than other door types. These doors are easy to install on your building end walls. The door’s frame, tracks and components are made of very heavy gauge steel to withstand severe wind speeds and industrial use. 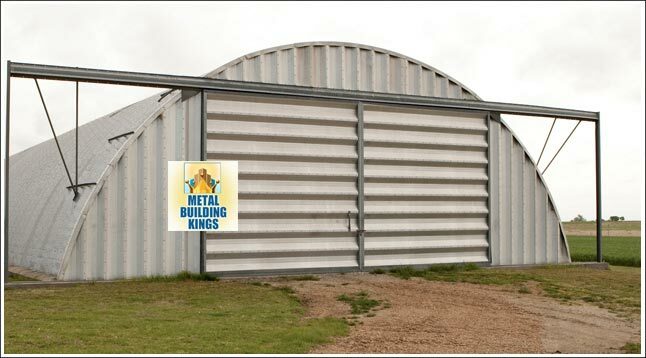 Contact Metal Building Kings® for the right style and grade door for your steel building or metal garage kit.